Ronan Chief Kane McAllister reaches for the pass. Ronan Chief quarterback Eric Dolence fights for some running room. 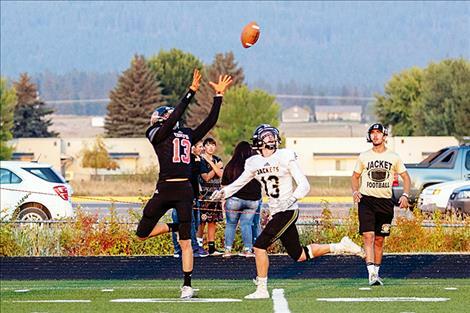 RONAN – The Stevensville Yellowjackets eked out a slim win over the Ronan Chiefs in their season home opener on Friday evening at home. The Yellowjackets walked off the field with the win, besting the Chiefs 26-25, in a game that came down to the final minutes. While this is the second loss in a row for the young Ronan team, it’s a closer score than Coach Matt Detwiler has seen so far. 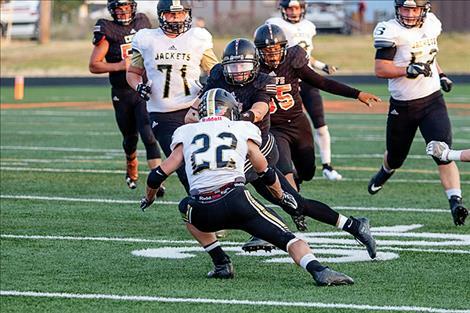 The Chiefs came close when junior Kuba Detwiler picked off a Stevensville pass and returned for a touchdown with two minutes and 33 seconds left in the fourth quarter, but the Yellowjackets managed to hold on to their slim lead by stopping the attempted two-point conversion. 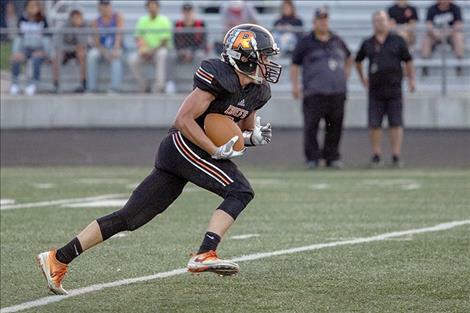 In a game of back-and-forth touchdowns, points were put on the board for the Chiefs by Zane Walchuk, Kane McAllister, Kuba Detwiler, and junior quarterback Eric Dolence. Dolence scored three touchdowns, two on pass receptions of 61 yards to Walchuk, 34 yards to McAllister, and a one-yard sprint into the end zone in the fourth quarter. Kuba Detwiler had the fourth quarter 43-yard intercepted pass for his score. The Chiefs will take on Dillon in an away game on Friday evening. 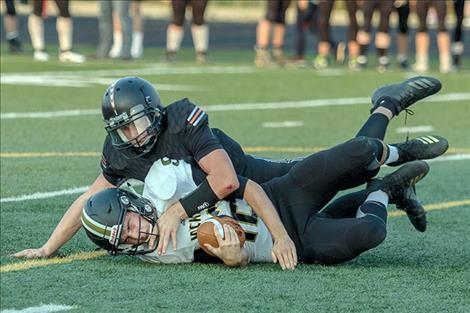 “Going into Dillon this week, we are going to stay focused on us as a team when it comes to tackling, being better conditioned and consistency on both sides of the ball,” said coach Detwiler.